Yeah that’s right, I’ve never ever had a facial before today! My skin hates me at the moment, all of the Christmas food and stresses of life have left me looking a little worse for wear. With break outs and horrible visible pores, I decided that enough is enough and it’s time for a clear out! I contacted local holistic & beauty therapist Zélie after who runs an amazing little treatment parlour in her back garden, Zélie’s Beauty. The 60 minute treatment includes a Cleanse & Tone (Skintruth), followed by a face and shoulder massage with a very fragrant mixture of oils. After this the skin is freshened up with a very, very gentle exfoliator (Green People) with a gorgeous citrus & bergamot scent, which both uplifts and relaxes. It was so nice not to be scratched to death by this product – lots of exfoliators can be very far too abrasive, but this was a creamy texture with tiny exfoliants to simply remove the dead skin cells and refresh your skin! This was followed by a lovely Green People mask, which didn’t burn or freeze my face (miracle?! ), and whilst this set I was treated to an amazing complimentary hand massage, which was so relaxing. I tend to hold a lot of tension in my hands, and always have them clenched or gripping each other until my circulation pretty much stops (I’m not crazy I swear), so the hand massage was exactly what I needed to break that cycle. Post face mask my skin was moisturised by another Green People treat, which although came in a large dose, was almost all absorbed by even my skin, which tends to reject most moisturisers. I must admit that a few hours later I’m starting to feel a little oily, but I imagine it would be absolutely fine in smaller doses or used over night. Overall, it was a really great experience and I would definitely recommend to a friend! Green People is a brand I’ve wanted to try for a while, but have been worried about making the investment, so it was great to be treated to so many different products in one go, to give me a good idea of what the brand is like! 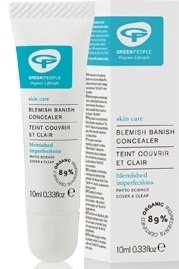 I was also treated to a tube of the Green People Blemish Banish product, which is a concealer with spot healing properties – perfect for my skin at the moment. I’ve got to say that I think it does work, my spots weren’t as sore and were much less red after wearing this, and coverage is great. I’m really not keen on the texture… it made my skin feel a little balmy, which is the main reason I don’t wear any make up, as well as this it only comes in one shade! I can’t stand companies that think there is only one shade of skin – it simply is not logical! I wouldn’t recommend this product for people with dark or very fair/porcelain skin tones! What facials do you treat yourself to? Do you find them an essential part of your routine?